Many foundations have the treat of operating in a decorated space full of art. The art may be finger painted by kids who benefit from a funded program, or decorative art initially acquired to enrich and enliven the space. When a foundation spends down, what happens to the art? We spoke with the Andrea and Charles Bronfman Philanthropies art curator Franklin Silverstone to find out. Q: How did you build the collection over ACBP's history? A: As you know, Charles is an avid supporter of Canadian culture, and so he wanted to encourage Canadian decorative arts with a collection of his own. I visited various galleries in Canada to see what was on the art scene. I put together a container of my findings and shipped it to Montreal, moved the findings into a friend’s gallery and on Mondays, when the gallery was closed, our ‘jury’ – the directors and founders – would vote. It was like the Roman games; either thumbs up, they were buying, or thumbs down, not a chance. Little by little we built the collection. Charles and I went to the Heller gallery in New York one day and there were glass 'birds' suspended from the ceiling, works by Lino Tagliapietro – immediately recognizable as our adopted logo. Those glass sculptures now hang in the entrance of our offices and have come to inspire the work that ACBP does to bring hope and meaning to the communities it serves. Q: How does art get tracked once it belongs to a foundation? A: In the early 1990s, when I saw the extraordinary new technology of art on discs and televisions, it inspired me to build a now-popular art management software system: Collectify Collector’s Edition and Collectify Home Inventory. Collectify documents and manages each item in the ACBP collection so that we never have to keep a piece of paper again. The objects are a personal asset recorded at cost. If it comes time to sell one’s art, there is a tax advantage to selling from a private foundation, where the foundation gains the value of the sale. Q: How does artwork generally get valued in philanthropy? Generally it is the art curators that determine the value of the art in a private collection housed in an office. I value all artwork in the ACBP New York office. I use fair-market value, meaning I look at the market and galleries and have a good sense of what buyers are paying. It is also a question of replacement cost – I have to determine if I can replace these objects for less than I paid for them. If they’re difficult to replace, value generally increases. As a rule, we settle value through the auction. I will send a report to an auction house through Collectify and ask them for a price for the object. Then, a reserve is placed on the item saying this is the minimum amount that we are willing to accept for it. Q: When a foundation plans to change over their collection or spend down, what options do they have with the art? A: When a foundation chooses to spend down, they can donate their art to an institution like a museum, sell it so that the dollars have the most impact either privately to collectors or to a gallery on consignment, or put it up for auction. If the art becomes a gift, then the collector has to get an independent appraisal. Q: Why is it important to feature art in the foundation offices? Prior to disposing of the collection as well as moving to new premises in New York, the staff was given the opportunity to choose art that meant a great deal to them. We then decorated the foundation’s space. At worst, featuring art in the office is better than looking at a plain wall, and at best - it makes the staff and guests feel more comfortable. I suppose the staff spends most of their time in office. It’s colorful and it’s bright, and it gives its audience a sense of the breadth of Canadian decorative arts. Q: What has ACBP decided to do with the collection? 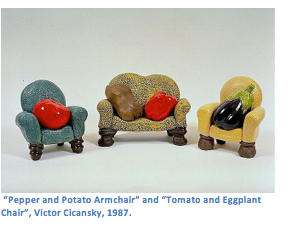 A: Right, what do you do with a couch potato sculpture! What we see in the office currently will be the last of the Claridge Collection. I divided and continue to divide objects in Charles’ collection to go up for auction. Charles is committed to Historica Canada, a program of ACBP that promotes Canadianism. As his collection was largely comprised of Canadian artists, Charles decided that it was appropriate and intentional to auction the objects and give the proceeds to this core commitment. Its mission is what Charles’ collection does: celebrates and shares the cultural joys of Canada. Franklin Silverstone is the curator for Charles Bronfman and the curator of The Claridge Collection of Canadian Arts and Crafts.